Most of you already know about “top” command, don’t you? Yes, It provides dynamic real-time information about running processes in any Unix-like operating systems. A few developers have built graphical front-ends for top command, so the users can easily find out their system’s activity in a graphical window. One of them is Gotop. As the name implies, Gotop is a TUI graphical activity monitor, written in Go language. It is completely free, open source and inspired by gtop and vtop programs. In this brief guide, we are going to discuss how to install and use Gotop program to monitor a Linux system’s activity. Gotop is written using Go, so we need to install it first. To install Go programming language in Linux, refer the following guide. This command will download gotop binary and save it inside go/bin folder in your current working directory. Just make the binary executable and copy it to your $PATH. Alternatively, there is a script to download the prebuilt gotop binary to your system. This script will download the correct binary for your system from the releases page. It doesn’t require you to install Go. The above command will download gotop binary to your current working directory. Make it executable and move to your $PATH as shown below. If you’re using Arch-based systems, Gotop is available in AUR, so you can install it using any AUR helper programs. Gotop usage is easy! All you have to do is to run the following command from the Terminal. There you go! You will see the usage of your system’s CPU, disk, memory, network, cpu temperature and process list in a simple TUI window. To show only CPU, Mem and Process widgets, use -m flag like below. You can sort the process table by using the following keyboard shortcuts. For process navigation, use the following keys. UP/DOWN arrows or j/k keys to go up and down. Ctrl-d and Ctrl-u – up and down half a page. Ctrl-f and Ctrl-b – up and down a full page. gg and G – iump to top and bottom. Press <TAB> to toggle process grouping. To kill the selected process or process group, type dd. To select a process, just click on it. To scroll down/up, use the mouse scroll button. 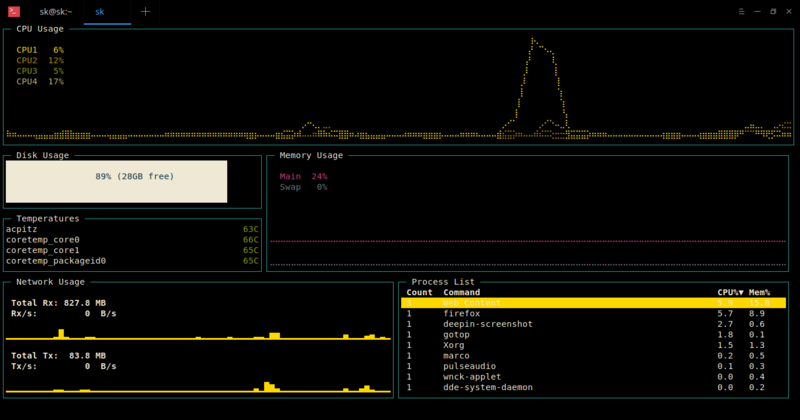 To zoom in and zoom out CPU and memory graphs, use h and l. To display the help menu at anytime, just press ?. I will give it a try. But what terminal are you using? It looks like you could open multiple tabs! Thanks for the update. It works now. Thanks for pointing it out. I just updated the installation instructions. It should work now.